The saturation of hard drive enclosure is quite the opposite of the digital audio player market -- due to the generalization of these boxes, it's hard to set one above another. However, if you want to take close looks at each one, you will notice the differences -- and by these differences it will determine if the enclosure is up as your hard drive's new house. This includes aspects such as aesthetics, design (Physical build-wise), form factor, compatibility, performance, and price. At the 3.5" level, the Thermaltake Silver River DUO is already our favorite -- as it fits almost perfectly into every criteria. Today, we'll take a look at the Icy Box IB-266StUS-B. How well will this product step up in the 2.5" area? Let's give it a good look. Our review unit came in a small UPS box from their American offices. Except for the fact that the shipping box itself was slightly crushed, the content inside remains in excellent condition. Just if you are wondering, Icy Box is by no means an unknown company -- the ownership of this brand is retained under Tagan -- a well known manufacturer of high quality, performance power supplies among the enthusiast market. Our review unit of the Icy Box IB-266StUS-B came in a small retail box (Not shown). The retail box is literally a cardboard constructed box; in which I must compliment them for not using any sort of blister packs. It's nothing special though -- the design is rather plain. Out of the box, there's a nice bundle of included accessories. Besides the Icy Box 2.5" enclosure itself, also included is a USB mass storage device CD for older operating systems, a brief manual, a USB power cable, USB data cable, as well as an eSATA cable. Also included is a small pouch to hold and protect the Icy Box enclosure for traveling. The connection panel is located at the back of the Icy Box 2.5" enclosure. From the left is a DC power input, and then an eSATA port as well as an USB connector. The USB jack is a non-proprietary, standard digital camera connector. There's no on/off switch available on the Icy Box 2.5" SATA enclosure. Using an USB connection, most modern computers with self-powered USB ports (500mA @ 5V) should supply enough power to the 2.5" HDD for it to be functional. If not, you can connect the additional USB to DC power adapter cable (Included) for additional power. The USB power cable will be required if you use eSATA, however; since the eSATA interface itself does not supply power over the data cable. A closer look at the SATA to USB 2.0 bridge controller chip. According to manufacturer's specifications, it is a Sunplus 215A USB2.0 to SATA Host Bridge. A link to the manufacturer's page. After unscrewing four screws from the bottom of the unit, it will disassociate into two separate units. Please keep in mind that the screws are rather small; so you'll need a small screwdriver to remove them from the Icy Box IB-266StUS-B.. The construction is rather simple. Internally, in the part as displayed in our photo above, shows an array of circular pits to allow breathing room for the hard disk. The controller/adapter board resides on one side installed with a two screws. A couple wires are led to the front of the Icy Box enclosure to support two LEDs. The wires are held to the side through utilization of several hooks. Installation of a hard disk remains a very simple procedure -- this step is a tool-free method. Simply slide the drive in an angle and connect it to the appropriate connectors (SATA and power) and it will automatically lock into position. Once the cover is replaced and screws are attached, construction is complete and the external hard drive is ready to use -- and go through our benchmark tests! A blue LED will be lit to indicate its power status, while a second blue LED will flash during disk activity. In our tests today, I won't get into performance analysis of multiple file writes and multiple file reads as we've done previously in our storage reviews. The reason behind this is the influence of eSATA versus USB is not quite relevant to drive I/O performance -- it is quite limited to the hard drive itself, and we are not reviewing the hard drive itself today. Unless, of course, it has been recorded that the performance of the drive controllers on Icy Box IB-266StUS-B were THAT bad, then we will investigate and take such into account. 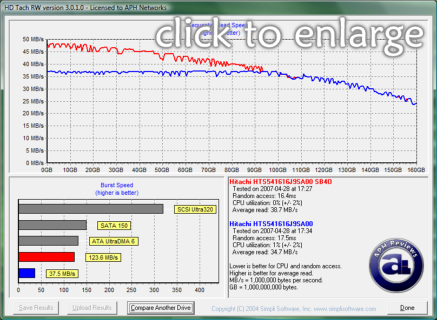 Let's go over our HDTach benchmarks, which is an OS independent industry drive performance testing tool. The USB ports on our system are controlled by the NVIDIA NF570MCP southbridge, while the external eSATA port on the Asus P5NT-WS is powered by a Silicon Image Sil3531 controller. As you can see in our benchmark results above from HDTach RW 3.0.1.0, USB2.0 (Blue line) resulted in a constant sequential read speed, while eSATA (Red line) had faster read speed at the beginning of the drive and much drops as it approaches the other edges. This is very common for hard drives, and a comparison graph as shown above is a clear demonstration of USB bottlenecking the drive as the read speed is consistently slower than the slowest read speed obtained using eSATA at the end of the drive. You can see at the starting point of identical performance is where the USB interface stops limiting the performance of the drive, and rather the drive itself. Benchmark result and latency is negotiable that the results are basically the same. eSATA permitted much better burst speeds at 123.6 MB/s, while using USB 2.0 interface the burst speed is just below 3 MB/s over consistent read speed. Consistent read speed for USB 2.0 is actually one of the best I've seen at 34.7 MB/s, when compared to the eSATA performance of 38.7 MB/s. However, eSATA is controlled by the motherboard rather than a controller on the enclosure -- so it remains a good reference of what kind of performance level is seen using USB and how much it may be limiting drive performance. On the other hand, I have tested the drive using HD Tach 3.0.1.0 in my laptop with an ICH7M southbridge and obtained very similar results as the eSATA line graph as displayed in our screenshot above. As Serial ATA were originally designed for internal hard drives, common external storage mediums utilize multipurpose interfaces such as Firewire or USB. While technology such as USB 2.0 provides up to 480Mbps of theoretical bandwidth, the majority of external storage devices cannot hit over half of such theoretical speed. In addition to that, features such as SMART proprietary to internal interfaces such as SATA or PATA is unavailable to externally enclosed hard drives. The introduction of eSATA provides quite a different story. Newer motherboards, including certain value inclined motherboards from major manufacturers such as abit or Asus, ships with at least one eSATA connector. The specification of eSATA were finalized in 2004; however adoption of such interface is not too widely available until just recently. The idea behind eSATA is not just about the limitation of cable length -- but basically a port of internal SATA to something available externally for storage devices. More information available at the Serial ATA International Association. This change basically gives users an opportunity to use external hard drives with the same performance as if the hard drive is inside the computer -- giving it the full potential of the drive and your computer without limitations due to the interface. This also makes once proprietary internal features, such as SMART status, now available to external devices. In general, the Icy Box IB-266StUS-B is definitely one excellent 2.5" enclosure. With decent external appearance, easy installation and usage, as well as very commendable USB performance, if you are looking for an eSATA+USB 2.5" SATA enclosure, this is the way to go. However, if it implemented wider compatability such as PATA support like the Thermaltake Silver River DUO as well as a hardware power switch, that would be excellent. Otherwise, if that doesn't matter to you, I'd pick one up if conveniently available. Special thanks to Raymond and Naninni over at Tagan for making this review possible. - The rating 7/10 means "Great product with many advantages and certain insignificant drawbacks; but should be considered before purchasing". - The rating 8/10 means "Definitely a very good product with drawbacks that isn't likely going to matter to the end user". - More information in our Review Focus. Excellent 2.5" SATA enclosure that offers eSATA as well as excellent USB 2.0 performance.